If you’re looking at Liquid Web as your next host, then this article will help you decide if it is the right hosting for you. In this article we cover client support, some pros and cons and several plans Liquid Web offer. Our final verdict is where we consider all features and recommend the best plans. Let’s begin by answering whether you should use Liquid Web hosting or not. Get up to 56% OFF: Liquid Web Dedicated Server Specials! Should you use Liquid Web? If you are in the market for a high performance host, then Liquid Web hosting is for you. They offer a variety of products which focus on higher traffic websites. With great security features, fast page load times and a 100% uptime guarantee, their service is worth every cent. What are the Pros & Cons of Liquid web? Security features – Liquid Web offers great security features which keep your files, data and website safe from attacks. Malware scanning, SSL, firewalls and much more are included in each plan. Plans are coupled with the security features which suit them best. Money back guarantee – Liquid Web hosting provides a 30-day money back guarantee if you are unhappy with their services. This 30-day money back is seemingly standard within the hosting industry, however, it still is a great plus if you were to decide to change hosts. Exceptional speed – One thing that is standard with Liquid Web is speed. It won’t take more than one search to find that every user raves about how fast page load times are. Unlimited WordPress plugins – Many web hosts limit the amount of plugins you can have, Liquid Web however, does not. When choosing one of their WordPress plans, you will be able to have limitless plugins on your website. Uptime guarantee – Liquid Web guarantee their uptime at 100%. This is quite a bold statement as many of their competitors will go for 99.9% or 99.8% uptime. Liquid Web however is so confident that they guarantee their uptime percentage at 100% and so far we haven’t seen any information to the contrary. Shared hosting – Liquid Web was designed to serve those high traffic websites and that is exactly how they have set up their plans. Shared hosting is not included in their list of offerings and they opt to focus rather on WordPress, Cloud and dedicated hosting services. Cost – Liquid Web is priced quite a bit higher than their competitors, but there is a good reason for that, they are providing a much faster and reliable service and with better support than their competitors. What hosting plans and features does Liquid Web offer? As mentioned in the cons section, Liquid web does not offer shared hosting plans and rather focus on WordPress, VPS, Cloud, Dedicated and reseller hosting. WordPress hosting – Liquid web has an environment designed specifically for WordPress and the content management system comes pre-installed. With several themes and drag and drop design options, you will quickly and easily be able to create the website you want. VPS hosting – Liquid web offer the best VPS hosting on the market for their price point. Their RAM and storage totals are unrivalled especially in terms of enterprise level hosting. Their pricing system is also unique as they only charge for the days of the month where you actually use their service. This is great if you decide to go elsewhere or shut your site down. Cloud hosting – Cloud hosting allows for resources to be shared over multiple servers. Liquid web offers a variety of tiers for Cloud hosting. They offer plans in a public, private and dedicated cloud. With Cloud hosting you also have your choice of operating system. Dedicated hosting – Dedicated hosting is the most secure and powerful hosting available. Liquid web offers managed dedicated servers which outclass most of the competition. Their target market are those businesses who want peak website performance and also have the money to fit the bill. Reseller hosting – if the hosting business is something that interests you, then maybe Liquid web has the reseller plan to match this interest. They offer both VPS and dedicated reseller plans whose features are in line with those offered to their users. What is Liquid Web Customer Service like? Customer service is an area where Liquid hosting really shines. They provide 4 communication channels namely their live chat, telephone, email ticketing service and their knowledge-base archive archive. Live chat provides the quickest response times and the support staff handle the most common and basic web issues. Liquid web’s telephone service provides the next level of support; you can expect the staff to be friendly and knowledgeable. The support channel Liquid web should be most proud of, is their ticketing service. Response times are under 30 minutes where some of their competitors take up to 18 hours to respond to client queries. There is no doubt that Liquid Web hosting is one of the most powerful hosting services available right now. This can be seen in the fact that they don’t even have a shared hosting plan. 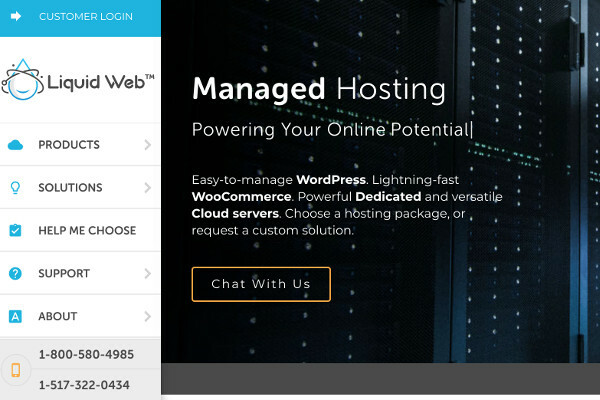 From WordPress hosting to Dedicated hosting, Liquid Web maintain great speed and security. Their VPS hosting is the strongest on the market at their price point. The unique pricing style they use also provides value, as you are able to cancel your plan whenever you want to and only play for the days services were used. From a reseller perspective, although Liquid Web does have some interesting plans on offer, we would have to say that Hostwinds provides the better overall reseller hosting plans.